As the aircraft lifted off the runway and propelled itself into darkness, I clutched my travel pillow and hoped for a smooth flight. I was heading to Peru to study the effects of tourism on culture and the environment with the non-profit eco-tourism group, Crooked Trails. Crooked Trails and Western Washington University, where I was studying for an Environmental Studies degree, had partnered up to create an educational trip to benefit both the students and the communities to be visited. So, I signed up and there I was, on my first solo journey abroad. As a nervous traveler, I began to question my decision to enroll in the three week trip. In the past, I had only travelled with my family in very controlled and sterile conditions. One memorable resort offered a water park for guests, private beaches, classy restaurants, and full bar service at the man-made lagoon. This was my experience in Haiti. As I thought about this on the plane, I realized the trip in Peru would force me to take my blinders off and to reflect on my blessings. What I didn’t anticipate was that the ensuing experience would transform my life and result in my decision to work toward a career in environmental and community conservation. In addition, the journey would revolutionize the way I confront challenges and assess goals. 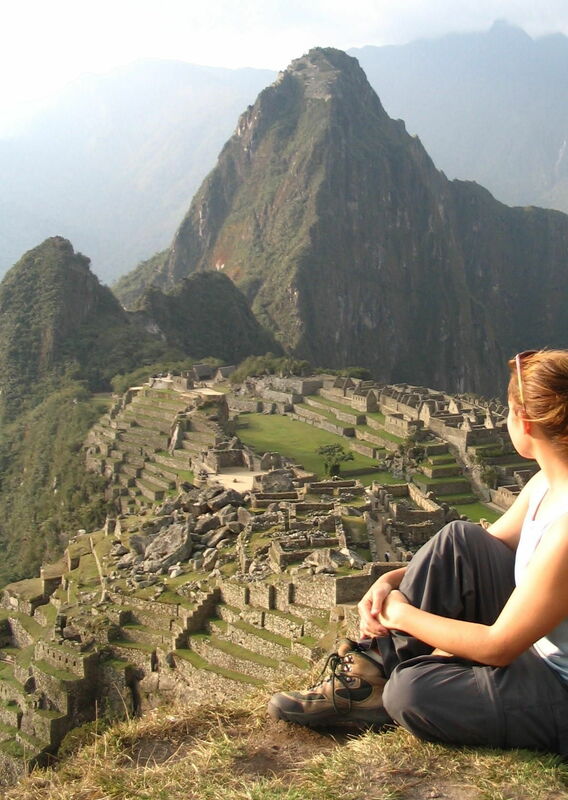 With Peru as my teacher, I was about to learn the most significant lessons of life and form the foundation upon which my subsequent education and professional experience would be built. Brick by brick I literally began to build that foundation in the small indigenous community of Vicos set high in the Andes Mountains. Only two days into the trip, our small student group split up into sets of three each to live with a Quechua host family for several days. The purpose of our stay was to gain a better understanding of their culture in order to develop ideas of how to preserve it through ecotourism. We’d eat the same foods, walk the same paths, and sleep in the same huts as our host families. Over the next several days the villages and students came to a joint decision: an interpretive center would be the perfect catalyst to connect tourists with the Vicos community and their heritage. Within days, I was working shoulder to shoulder with the community members, packing mud and straw into wooden molds to build the foundation. The symbolism of the work was obvious; I was making stronger my personal foundation along with the physical foundation of the interpretive center. In that moment I began to feel more confident in my abilities and that of the community as a whole. It is now a firm belief of mine that one of the most effective ways to approach conservation issues is at the community level. Effective and compelling communication is essential when working to solve complex issues with a large group of people each of who have different interests and levels of understanding. Although the Quechua people and I didn’t speak the same language, we worked to understand each other through gestures and facial expressions. I now apply what I learned from this valuable lesson when discussing complex environmental topics with others. If I take a moment to appreciate the background and knowledge base of those I work with or teach, I find it easier to convey a message that resonates on a more personal level. In just a few days, I built a new foundation within myself derived from the strength of effective communication, belief in community, and the power of my own two hands. Not a minute too soon was that feeling of physical and mental strength challenged. After finishing the foundation for the interpretive center, the community members wanted to celebrate by taking us on a hike to a lake high in the mountains. It would be an eight hour trek up to the lake and we were warned it wasn’t going to be easy. Feeling high from the work we did on the center, our small student group enthusiastically agreed that we were strong enough to do the hike. Nine hours later, I was strapped to the back of a donkey, fading in and out of consciousness. After a grueling march up to the lake, my body began to feel show signs of Acute Mountain Sickness. Despite having four days of acclimation under my belt at 13,000 feet above sea level, the climb to the lake at 16,000 feet did me in. I could no longer walk and my vision was blurry, so I clung tight to the pack donkey that had already worked so hard to bring our lunch up the mountain. Back in the village, I was bed ridden for two days. When my fever kept me awake, the host family’s daughters would sing me to sleep. Their son, who was only 6 years old, offered to run five miles into town to find me a piece of fruit (which was the only thing that sounded appetizing). The mother made me herbal tea and the father fetched me blankets from neighboring communities. The family barely knew me but treated me like one of their own. It was the most humbling moment of my life. Soon I recovered, and felt as healthy and strong as ever. With a newfound understanding of myself and the world, I traveled with my group across the Andes Mountains and into the depths of the Peruvian Amazon. During our time in the jungle, we worked with the local community of Infierno to develop a plan to initiate a sustainable tourism business. Primarily dependant on animal trafficking and timber, Infierno’s Ese’ja people were seeking a way to make a living in a sustainable manner. Although open to the idea of becoming involved in ecotourism, the community as a whole could not agree on the best approach. We worked together to dissect each idea and come up with solutions to problems each could cause. It took many hours but in the end, we found a way to agree on a variety of small but crucial steps the community would implement to conserve their natural environment and promote sustainable tourism. The experience of producing a sound solution together with my peers and the Infierno community was a lesson in problem solving and leadership. The trip came to a close with a grand finale visit to Manchu Picchu. We hiked four hours along a portion of the Inca trail leading to the Sun Gate overlooking the ancient city. I was so moved by the sight and by my transformative experience during the trip that tears of joy dripped from my cheeks. Sitting a ridge above Manchu Picchu, I reflected on the lessons learned in the last three weeks: humility, strength, culture, leadership, communication, and the power of community. The trip also created in me a renewed sense of purpose in the world. Looking down on the ancient Inca landmark, I decided right there to use my new knowledge to become a conservation biologist. Such work would allow me to work with indigenous communities to develop programs to preserve their livelihood and the ecosystems they inhabit. I could work with eco-tourism groups as well, promoting creative ways to gain experience abroad while helping to conserve the people and environments they frequent. As the sun slipped behind the mountains, our group headed back to our modest hotel in the high jungle to prepare for departure the next day. As the airplane lifted off the runway and propelled itself into the sky, I leaned onto my ratted travel pillow and settled in for a smooth flight. Visions of the people and places I was leaving behind faded in and out of my mind. I was also leaving behind my former self, a young girl scared of the unfamiliar and unaware of her own potential. I was about to arrive home as a new person, a woman confident in the face of challenge and empowered to create change.